Fahad Murtaza is a WordPress enthusiast who started his journey with WordPress in 2004. He recently joined Stanfield Real estate and started building their web stack on WordPress along with other technologies. He loves sharing knowledge and his talk at WordCamp Biratnagar 2018 was also about the WordPress hooks and how they make life easier. 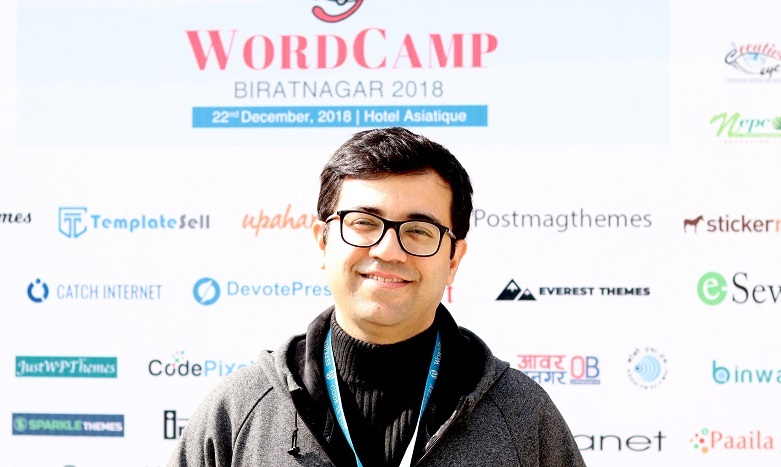 Fahad Murtaza at WordCamp Biratnagar 2018. We also got to interview Fahad Murtaza. Here’s the full interview. I am a Software Engineer from the Himalayas in Pakistan. I run a software engineering consultancy, Gravixar in UAE and Pakistan. My city is Mansehra, a small town in the lower Himalayas. The community is just getting started and we had our first WordPress meetup here in January 2019. I flew from Dubai to attend it as I was one of the organizers. WordCamp in Pakistan is a relatively new thing but there existed a huge community of professionals and enthusiasts alike which never got together under one roof. Now we have such platforms in multiple cities around Pakistan including my own. Back in around 2003, I found out about WordPress and then started coding themes and made a plugin after looking at the Hello Dolly plugin. And it got me hooked. I created my own blog which went defunct so many times because I wanted to improve on it. This taught me enough to get started as a professional and since then, I have never looked back. WordPress always had a brilliant community. I never faced a problem which I couldn’t solve without someone’s help. Figuring things out was always easy. It’s what kept me connected. I started teaching WordPress to my fellows and that’s where I learned a lot myself. I believe the community is what makes it great and the same thing helped me as well. Well, I always want to share my knowledge. I always had an imposter syndrome, so, I never thought my knowledge could be useful at any place. WordCamp Islamabad changed that and so did Biratnagar. I realized I could share my knowledge with many who can benefit and I think I was able to do that with both WordCamps. So, as soon as I was accepted as a speaker for WordCamp Biratnagar, I bought my tickets. Luckily for Nepal, I didn’t have to go through the hurdles of visa applications. And I just bought the plane tickets and left. I think they learned better ways to do WordPress development. I introduced clean coding practices but kept it simple so that people could get inspired and do a better job while crafting WordPress plugins and themes. It was also for beginners and from the feedback I got, I think I was able to inspire a few people to write better code using WordPress hooks. Is this your first time visiting Nepal? Are you having a good time here? Yes, I had a fun time in Nepal. I am coming back for WordCamp Kathmandu. I am in love with the beautiful country. Next time, I will be exploring more places. It’s amazing. I met a few people who have built some amazing products and teams. I was very much impressed by the WordPress community of Nepal. Knowledge sharing, the kind of talent it attracts and the overall learning atmosphere. It had a lot more students than professionals which is an amazing thing. Too many young and energetic minds to inspire. I am a WordPress Developer so I try to share my knowledge with the people whenever I can. That means WordCamps, meetups, and helping people on the web. Every week, I help a few people who contact me with their WordPress related problems. Use Google. Search for anything you are not sure about. And ask for help. You’ll be surprised how many people with expertise are always willing to help. I think it’s getting better. I see more and more ladies getting into WordPress and building businesses, which is amazing as it allows them to work from anywhere and be successful at what they do. I use codex all the time and I explore WordPress core in my IDE all the time. I also Google with detailed queries and read the top two or three results. Stack Overflow usually has other people experiencing the same issue and have good solutions to WordPress problems that a lot of developers face. I love photography, I travel whenever I can and I play learning games with my son. My latest hobby is listening to audiobooks, which have been really helpful in learning new things over the past few years. I don’t use it on my client’s websites but I am eager to get into Gutenberg. For now, I just use a classic editor. But I am sure it has a great promise and will be a really useful thing in the future. I am not just very excited to use it at the moment as the Gutenberg release has a number of unresolved bugs. I think, even in its infancy, it offers many opportunities for new product development. However, I definitely want to try it on a new project that I start from scratch. This interview sure has helped us know more about Mr. Fahad Murtaza and his thoughts towards the community. We want to thank him for taking out his time for the interview. Do you want to know more about this inspiring persona? Find him on Facebook or Twitter. I am truly thankful to the owner of this web page who has shared this impressive piece of writing at here.